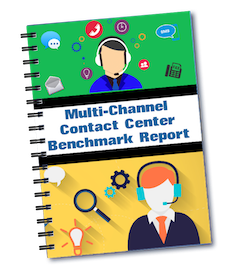 BenchmarkPortal announces the launch of its Multi-Channel Contact Center Benchmark Report, which represents a major advance over previous efforts to benchmark multi-channel and omni-channel contact centers. Holder of the world’s largest and most respected database of contact center metrics, the company has concluded a year-long project to optimize analysis of performance metrics for all customer channels: Phone, Email, Web Chat, Social Media, Fax, Postal Mail and Other. This 106-KPI offering provides organizations exceptional insights into the current state of their contact center’s customer experience and operational performance across all Customer contact channels. “This does much more than put interesting numbers side by side,” said BenchmarkPortal CEO Bruce Belfiore. “Our new reports include a statistically advanced Performance Matrix and provide the ingredients for in-depth discussions on strengths, weaknesses and ways to reduce costs and improve quality across channels. It is the perfect performance improvement tool for contact center analysis. Managers seeking to offer seamless omni-channel experiences will want this information.” The company’s benchmarking process, which is patented, allows for continuous updating of the database, making it unique in the industry. As customer contact operations become more sophisticated, the BenchmarkPortal team is dedicated to continuing its leadership with the methodologies, tools and technology needed to help managers optimize their center’s performance. The Multi-Channel Benchmark Report is designed to provide managers with immediate value in terms of business intelligence that identifies ways to improve costs and improve the customer experience. With over 40 industry verticals (including government and nonprofit), the Multi-Channel report ensures apples-to-apples comparisons. Users of the BenchmarkPortal Multi-Channel reports receive professional interpretive analyses of their individual reports through a WebEx-style interactive presentation,that provides actionable analysis and exploration of best practices solutions. From its origins at Purdue University in 1995, BenchmarkPortal has grown to be a global leader in the contact center industry, providing benchmarking, certification, training, consulting, research and industry reports. The company has gained international recognition for its innovative approach to best practices for the contact center industry. BenchmarkPortal’s mission is to provide contact center managers with the fact based tools and information that will help them optimize efficiency and effectiveness in their customer interactions. For more information on BenchmarkPortal please call 1-800-214-8929 or visit www.BenchmarkPortal.com.